The recovery of mitochondrial DNA (mtDNA) from the right arm bone (humerus) of the original Neandertal fossil discovered in 1856 in a cave in the Neander Valley, near Dusseldorf, Germany, has been hailed as a stunning feat of modern biochemistry. Christopher Stringer (Natural History Museum, London) said: ‘For human evolution, this is as exciting as the Mars landing’. The achievement was announced in the July 11, 1997 issue of the journal, Cell.1 There is no question that the accomplishment was both conceptually and experimentally brilliant. However, the brilliance of the methodology does not guarantee the accuracy of the interpretation which the authors of the Cell article have placed on the data. Based upon the differences between the Neandertal mtDNA and modern human mtDNA, the evolutionary interpretation is that the Neandertal line diverged from the modern human line about 550,000 to 690,000 years ago and that the Neandertals became extinct without contributing mtDNA to modern humans. The implication is that the Neandertals did not evolve into fully modern humans, that they were a different species from modern humans, and that they were just one of many proto-human types that were failed evolutionary experiments. We alone evolved to full humanity. Two factors make humans unique. We are the only members of our genus, Homo, on the planet; and we are interfertile world-wide. Biologically, we humans are an oddity. Almost all other organisms have many kindred species, some living and some extinct. Since evolutionists believe humans are just a part of nature and of the evolutionary process, they believe that there must have been a number of proto-human species at one time, even though we are now alone. The fossil record is now being reinterpreted to bring human origins more in line with the rest of nature. Evolutionary trees are out. Evolutionary bushes are in. Homo habilis is being split into two separate species, Homo habilis and Homo rudolfensis. Homo erectus is being split into two separate species, Homo erectus and Homo ergaster. The Neandertals are just one of at least five twigs on the human evolutionary bush. Evolutionists do not know—and say that they may never know—from which of the twigs modern humans evolved. However, the Neandertals—through the interpretation of this mtDNA recovery—have now been eliminated from modern human ancestry. Since 1964 the Neandertals have been considered a sub-species of modern humans. They will now almost certainly be moved out of our species and back into a separate species, Homo neanderthalensis. (3)	the flawed interpretation of the mtDNA evidence. No one has had a worse public image to overcome than have the Neandertals. When that Neander Valley individual was discovered in a cave in Germany in 1856, the shape of his skull and the curves in the long bones of his body caused evolutionists to believe that the expected link between apes and humans had been found. Evolutionary preconceptions also guided the world-famous anatomist, Marcellin Boule, as he restored the Neandertal skeleton from La Chapelle-aux-Saints, France, to show the world what a Neandertal looked like—a stooped and stupid hunchback. This view of the Neandertal ‘Cave Man’ prevailed for 100 years. In the 1960s Boule’s glaring mistakes were corrected. It was realized that the Neandertal people, when healthy, stood straight and erect. The physical ‘redemption’ of the Neandertals was accomplished. However, the Neandertals were still considered to be culturally barren. Even the discovery at Shanidar Cave, Iraq, that the Neandertals buried their dead with flowers2 did not improve their general image. Many evolutionists still talk about the Neandertal people as having been culturally stagnant. They say that about 40,000 years ago, ‘The Great Leap Forward’ took place. Anatomically modern humans invaded Europe bringing art, technology, and innovation.3 The Neandertals, being outclassed, disappeared. In recent years, however, we have witnessed a cultural ‘redemption’ of the Neandertals is beginning to take place. The year 1996 saw the publication of discoveries of items of personal ornamentation used by Neandertals4,5 and the first example of Neandertal musical instrument.6,7 Archaeologist Randall White (New York University) says of the Neandertals: ‘The more this kind of evidence accumulates, the more they look like us’.8 It can now be said that every type of evidence that we can reasonably expect from the fossil and archaeological record showing that the Neandertals were fully human has already been discovered. The book of Genesis sheds light on the activity of early humans regarding the use of caves. The first reference to caves is in Genesis 19:30, which states that Lot and his daughters lived in a cave after fleeing the destruction of Sodom. This is in keeping with the use of caves throughout human history as temporary or permanent shelters. However, all other references to caves in Genesis refer to a usage that is seldom considered today. Genesis 23:17–20 (NIV) records a business transaction between Abraham and the Hittite, Ephron. Abraham wanted to purchase property in order to bury Sarah. Upon his death (Genesis 25:7–11), Abraham was buried in that same cave. In Genesis 49:29–32, Jacob instructs his sons that he, too, is to be buried in that cave where Abraham and Sarah were buried. We then learn that Jacob buried his wife, Leah there, and that Isaac and Rebekah were buried there also. Abraham and Sarah, Isaac and Rebekah, and Jacob and Leah were all buried in the cave in the field of Machpelah which Genesis 23:20 states Abraham purchased ‘as a burial site’. Only Sarah died in the geographic area of the cave. All of the others had to be transported some distance to be buried there, and Jacob’s body had to be brought up from Egypt. It was important then, as it is today, to be buried with family and loved ones. Krapina Rock Shelter, Croatia—75 (minimum) Neandertals buried. La Freesia Rock Shelter, France—8 Neandertals buried. Shanidar Cave, Iraq—7 Neandertals buried. Maude Cave, Galilee, Israel—7 Neandertals buried. Gutter Cave, Monte Circa, Italy—4 Neandertals buried. Tsar ‘Ail Rock Shelter, Lebanon—3 Neandertals buried. It is understandable why burial in caves was common in ancient times. Graves in open areas must be marked so that future generations can return to pay homage to their ancestors. However, grave markers or reference points can be changed, destroyed, or moved. Directions to the grave site can become confusing over time. Landscapes can change, and memories of certain features can become clouded. Just as Abraham did not always live in one place, so the Neandertals may have moved seasonally following herds of game. Since caves are usually permanent, it would have been easy to locate the family burial site if it were in a cave. One could be sure that he was at the very spot where his ancestors were buried. Most anthropologists recognize burial as a very human, and a very religious act. But the strongest evidence that Neandertals were fully human and of our species is that at four sites Neandertals and modern humans were buried together. In all of life, few desires are stronger than the desire to be buried with one’s own people. Jacob lived in Egypt, but wanted to be buried in the family cemetery in the cave of Machpelah. Joseph achieved fame in Egypt, but wanted his bones to be taken back to Israel (Genesis 50:25, Exodus 13:19, Joshua 24:32). Until recently it was the custom to have a cemetery next to the church so that the church family could be buried together. For centuries, many cities had separate cemeteries for Protestants, Roman Catholics, and Jews so that people could be buried with their own kind. That Neandertals and anatomically modern humans were buried together constitutes strong evidence that they lived together, worked together, intermarried, and were accepted as members of the same family, clan, and community. The false distinction made by evolutionists today was not made by the ancients. To call the Neandertals ‘Cave Men’ is to give a false picture of who they were and why caves were significant in their lives. If genuine mtDNA was recovered from that fossil from the Neander Valley, the results have been misinterpreted. ‘From one man he (God) made every nation of men, that they should inhabit the whole earth.’ (Acts 17:26 NIV). In comparing the Neandertal burial practice with Genesis, I do not wish to imply that Abraham and his descendants were Neandertals. What the relationship was—if any—between the people of Genesis and the Neandertals we do not know. Young-Earth creationists tend to believe that the Neandertals were a post-Flood people. Evolutionists date the Neandertals from about 300,000 to about 33,000 years ago. What is striking is that the burial practice of the Neandertals seems to be identical with that of the people of Genesis. The facial architecture is heavy, with the mid-face and the upper jaw projecting forward (prognathism). The nose is prominent and broad. The frontal sinuses are expanded. The lower jaw is large and lacks a definite chin. This same gradation from Neandertals to modern humans can also be seen in the fossil record. We are not referring to an evolutionary transition from earlier Neandertals to later modern humans. We are referring to morphological gradations between Neandertals and modern humans both having the same dates and living at the same time as contemporaries representing a single human population. Whereas evolutionists have chosen to divide these humans into two categories—Neandertals and anatomically modern Homo Sapiens, individual fossils are not always that easy to categorize. There is a wide range of variation among modern humans, and there is variation within the Neandertal category as well. A number of fossils in each group are very close to that subjective line, and could be categorized either way. These fossils constitute a gradation between Neandertals and modern humans, demonstrating that the distinction made by evolutionists is an artificial one. DNA is the incredibly complex molecule involved in the genetics of life. Deprived of the repair mechanisms found in the living cell, there is substantial breakdown of DNA within a few hours after the death of the organism. Causes of DNA degrading include water, oxygen, heat, pressure, time, exposure to transition metals (such as zinc), microbe attack, and radiation. This degrading involves the breakage of the cross-linking of the DNA molecules, modification of sugars, alteration of bases, and the breakage of long strands into strands that eventually become so short that no information can be retrieved from them. In dealing with the Neandertal specimen, the scientific team, led by Svante Pääbo (University of Munich), decided to search for mitochondrial DNA rather than nuclear DNA. Whereas there are only two copies of DNA in the nucleus of each cell, there are 500 to 1,000 copies of mtDNA in each cell. Hence, the possibility was far greater that some of the ancient mtDNA might be preserved. Further, because it has no repair enzymes, mtDNA accumulates mutations at about ten times the rate of nuclear DNA, making it, evolutionists believe, a more fine-grained index of time. Whether or not genuine Neandertal mtDNA has been retrieved is impossible for an outside observer to say at this time. Knowing the unstable nature of the DNA molecule, if DNA was retrieved from that Neandertal fossil, it is strong evidence that the fossil is not nearly as old as evolutionists claim—30,000 to 100,000 years. From a scientific point of view, the fact that the recovery may never be duplicated on another specimen could add a degree of contingency to the results. As far as the recovery, itself, is concerned, it is possible that the mtDNA is genuine. However, the evolutionary interpretation of those mtDNA sequences—that the Neandertals are a separate species and are not closely related to modern humans—is not scientifically justified. ‘The Neandertal sequence was compared to 994 contemporary human mitochondrial lineages, i.e., distinct sequences occurring in one or more individuals, found in 478 Africans, 510 Europeans, 494 Asians, 167 Native Americans and 20 individuals from Australia and Oceania. Whereas these modern human sequences differ among themselves by an average of 8.0 ± 3.l (range 1–24) substitutions, the difference between the humans and the Neandertal sequence is 27.2 ± 2.2 (range 22–36) substitutions. Thus, the largest difference observed between any two human sequences was two substitutions larger than the smallest difference between a human and the Neandertal’. When the comparison was extended to 16 common chimpanzee lineages, the number of positions in common among the human and chimpanzee sequences was reduced to 333. This reduced the number of human lineages to 986. The average number of differences among humans is 8.0 ± 3.0 (range 1–24), that between humans and the Neandertal, 25.6 ± 2.2 (range 20–34), and that between humans and chimpanzees, 55.0 ± 3.0 (range 46–67). Thus, the average number of mtDNA sequence differences between modern humans and the Neandertal is about three times that among humans, but about half of that between modern humans and modern chimpanzees. Statistics has been used to cloud a relationship between Neandertals and modern humans. It is improper to use statistical ‘averages’ in a situation where many entities are being compared with only one entity. In this case, 994 sequences from 1669 modern humans are compared with one sequence from one Neandertal. Thus, there cannot be a Neandertal ‘average’, and the comparison is not valid. Although it may not be the intention, the result of such a comparison could not help but be deceptive. The biochemistry in the experiment is brilliant but the mathematics leaves much to be desired. Kunzig’s illustration is misleading and totally inaccurate. Since, we are dealing with modern human ‘averages’, only a few of the modern humans would be exactly eight yards (eight sequences) from the centre. Almost half of them would be less than eight yards from the centre, with a few of them just one yard (one sequence) from the fire. Instead of ‘nobody more than eight yards from the center’, the rest of them would be more than eight yards from the centre, with a few of them 24 yards (24 sequences) from the centre. Since there is only one Neandertal individual, he would have to be spread out from 22 to 36 yards from the centre. But instead of the large gap between modern humans and the Neandertal that Kunzig was trying to illustrate, there would actually be a slight overlap of the modern humans with the Neandertal. Science writer Kate Wong, in the January 1998 Scientific American, states that the mtDNA variation between the Neandertal and modern humans was, on average, four times greater than that found between any two modern humans.42 The Cell authors said it was, on average, three times greater. Thus in the two most popular science magazines in the United States, mistakes were made in describing the interpretation of the Neandertal mtDNA. In both cases, the mistakes portrayed the genetic distance between modern humans and the Neandertal as being even greater than was originally reported in Cell. However, both mistakes were the result of the misleading and improper use of ‘averages’ by the Cell authors. Based upon their improper use of statistical averages, the authors of the mtDNA Neandertal study arrive at another fallacious conclusion from their experiment. They use mtDNA sequence differences as a measure of evolutionary time and distance. This is a universal practice in evolutionary studies. Hence, the Neandertals are placed in an evolutionary sequence between modern humans and chimpanzees. However, as we saw above, there are a few modern humans living today who have mtDNA substitutions inside the range of the Neandertal individual. Would not logic also demand that we say that there are a few humans living today who are less evolved than were the Neandertals, and who are more closely related to chimpanzees than were the Neandertals? A bias toward the more politically correct ‘Out of Africa’ model of modern human origins, which demands a separation of the Neandertals from anatomically modern humans. The misinterpretation of the mtDNA data is seen in the work of Pääbo and his associates. We have earlier shown that the Neandertal fossil evidence contradicts their interpretation of the mtDNA evidence. (b)	The bias toward the more politically correct ‘Out of Africa’ model of modern human origins. The popularity of the ‘Out of Africa’ model is due, in part, to its being so politically correct. Modern humans are said to have originated in Africa, a source of satisfaction to non-Western people who may feel that they have been exploited by Westerners. The model emphasizes the unity of all humans despite differences in external appearance. For many people it is an advantage to have the Neandertals removed from their ancestry. After all, who wants to be related to a Neandertal? The sudden replacement of the Neandertals by modern humans favors the newer and more popular punctuated equilibrium evolution model. We seem to be witnessing a classic struggle in palaeoanthropology between the molecules and the fossils. Some palaeoanthropologists themselves are bewildered at how rapidly their fellows have forsaken the fossils for the molecules. It is all the more surprising because the human fossil evidence clearly contradicts the ‘Out of Africa’ model. The European fossil evidence is against it, as we have shown in this paper. The Chinese fossil evidence is strongly against it, as Xinzhi Wu and Frank E. Poirier demonstrate.56 The Javanese and Australian fossils also witness against it.57 With the African fossils, the jury is still out. The reason is that the ‘Out of Africa’ model demands that the fossils fall within a certain time-frame. However, many of the fossils upon which the ‘Out of Africa’ model is based, such as the Border Cave fossils and the Klasies River Mouth Caves fossils, are very difficult to date. Regarding these differences, there are a number of legitimate interpretations of the mtDNA Neandertal data that have been ignored by Pääbo and his associates. Some of these interpretations may be more likely than others, but all are possibilities. That this particular Neandertal individual was from a small, isolated group. The Neander Valley of Germany is one of the northernmost Neandertal sites, close to the ice-age glaciers. Of the 345 Neandertal individuals discovered to date, only 14 are from Germany, and 12 of them were far to the south of this individual. That this particular Neandertal from whom sequences were derived was at one extreme end of a diverse spectrum in Neandertals that includes other more modern-like sequences. The recovery of mtDNA from other Neandertal individuals, if possible, may confirm whether or not this is true. That while Neandertal mothers did not contribute mtDNA to the modern gene pool, Neandertal fathers may have contributed nuclear genes to the modern gene pool. Throughout history, warfare, conducted by men, has been characterized by the victimizing of conquered women. Hence, Neandertal men may have made ‘unsolicited contributions’ to the modern human gene pool. Further, most migrations in history have initially involved men. The PCR technique is, says Tomas Lindahl, ‘notoriously contamination-sensitive’. What is most needed is an independent test of ancient DNA authenticity. Researchers, including Pääbo, believe they might have devised such a technique, based upon the ratio of amino acid racemization to DNA depurination, to determine if a particular ancient specimen might still contain retrievable DNA. In testing this new method for DNA in ancient specimens, they write: ‘… we excluded human remains because of the inherent difficulty of recognizing contamination from contemporary humans’.61 In other words, it is much easier to recognize modern human DNA contamination in ancient non-human specimens than in ancient human specimens. It is obvious that much of the contaminating DNA would come from modern humans because modern humans are doing the research and handling the ancient DNA. The closer ancient human DNA sequences are to modern ones, the harder it is to tell if they are truly ancient or if they are just the result of modern human contamination. Such concerns are justified since most evolutionists involved in mtDNA recovery favor the ‘Out of Africa’ model of human evolution which demands a separation of the Neandertals from anatomically modern humans. Hence, any future mtDNA evidence showing a close relationship of Neandertals to modern humans could be dismissed as contamination from modern human mtDNA and the results not reported. This would perpetuate the false idea that Neandertals and modern humans were not closely related. After 140 years, the Neandertals are still having to fight for their reputation. If genuine mtDNA has been recovered from the fossil from the Neander Valley, the results have been misinterpreted—both in a statistical and cultural sense. However, within the context of the Biblical record of human history, this individual is likely to post-date the dispersion from Babel (Genesis 11:8,9). This being the case, we can conclude that he, like all human kind, was a direct descendant of one of the sons of Noah (Genesis 9:19, 10:32). Krings, M., Stone, A., Schmitz, R.W., Krainitzki, H., Stoneking, M. and Pääbo, S., 1997. Neandertal DNA sequences and the origin of modern humans. Cell, 90:19–30. Return to text. Solecki, R.S., 1971. Shanidar: the First Flower People, Alfred A. Knopf, New York. Return to text. Diamond, J., 1989. The great leap forward. Discover, May 1989, pp. 50–60. Return to text. Hublin, J.-J., Spoor, F., Braun, M., Zonneveld, F. and Condemi, S., 1996. A late Neanderthal associated with Upper Palaeolithic artefacts. Nature, 381:224–226. Return to text. Discover, January 1997, p. 33. Return to text. Wong, K., September 1997. Neanderthal notes. Scientific American 227(3):17–18. Return to text. Science News, November 23, 1996, p. 328. Return to text. Solecki, Ref. 2, p. 69. Return to text. Corruccini, RS, 1992. Metrical reconsideration of the Skhul IV and IX and Border Cave 1 crania in the context of modern human origins. American Journal of Physical Anthropology, 87(4):433–445. Return to text. Corruccini, Ref. 10, pp. 440–442. Return to text. Quam, R.M. and Smith, F.H., 1996. Reconsideration of the Tabun C2 ‘Neandertal’. American Journal of Physical Anthropology, Supplement 22, p. 192. Return to text. Minugh-Purvis, N. and Radovcic, J., 1991. Krapina A: Neandertal or Not? American Journal of Physical Anthropology, Supplement 12, p. 132. Return to text. Clark, GA, 1997. Neandertal genetics. Science, 277:1024. Return to text. Johanson, D. and Shreeve, J., 1989. Lucy’s Child, William Morrow and Company, New York, p.49. Return to text. Ahern, J.C. And Smith, F.H., 1993. The transitional nature of the late Neandertal mandibles from Vindija Cave, Croatia. American Journal of Physical Anthropology, Supplement 16, p. 47. Return to text. Tattersall, I., Delson, E. and Van Couvering, J., (eds), 1988. Encyclopedia of Human Evolution and Prehistory, Garland Publishing, New York, p. 241. Return to text. Stringer, C. and Gamble, C., 1993. In Search of the Neanderthals, Thames and Hudson, Inc., New York, pp. 179–180. Return to text. Ref. 17, p. 56. Return to text. Oakley, K.P., Campbell, B.G. And Molleson, T.I., (eds), 1971. Catalogue of Fossil Hominids, Trustees of the British Museum— Natural History, London, Part II, p. 209. Return to text. Wolpoff, M. and Caspari, R., 1997. Race and Human Evolution, Simon and Schuster, New York, pp. 177,182. Return to text. Boule, M. and Vallois, H.V., 1957. Fossil Men, The Dryden Press, New York, p. 281. Return to text. Smith, F.H., Falsetti, A.B. and Liston, M.A., 1989. Morphometric analysis of the Mladec postcranial remains. American Journal of Physical Anthropology, 78(2):305. Return to text. Wolpoff, M.H. And Jelinek, J., 1987. New discoveries and reconstructions of Upper Pleistocene hominids from the Mladec cave, Moravia, CCSR. American Journal of Physical Anthropology, 72(2):270–271. Return to text. Minugh, N.S., 1983. The Mladac 3 child: aspects of cranial ontogeny in early anatomically modern Europeans. American Journal of Physical Anthropology, 60(2):228. Return to text. Smith, F.S., 1976. A fossil hominid frontal from Velika Pecina (Croatia) and a consideration of Upper Pleistocene hominids from Yugoslavia. 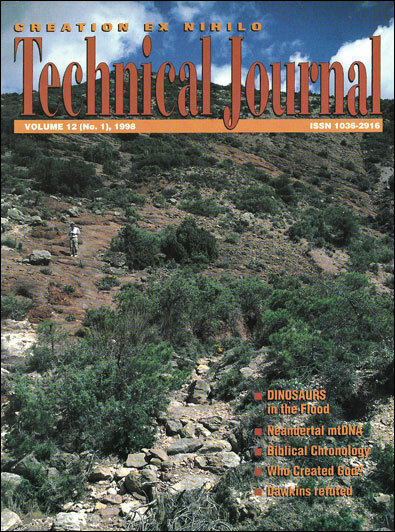 American Journal of Physical Anthropology, 44:130–131. Return to text. Ref. 20, Part II, p. 342. Return to text. Ref. 17, pp. 56,87. Return to text. Klein, R.G., 1989. The Human Career: Human Biological and Cultural Origins, The University of Chicago Press, Chicago, pp. 236–237. Return to text. Lindahl, T., 1993. Instability and decay of the primary structure of DNA. Nature, 362:713. Return to text. Pääbo, S., 1993. Ancient DNA, Scientific American, November 1993, p. 92. Return to text. Gibbons, A., 1998. Ancient history, Discover, January 1998, p. 47 Return to text. Mullis, K.B., 1990. The unusual origin of the polymerase chain reaction. Scientific American, April 1990, p. 56. Return to text. Koshland, D. Jr., and Guyer, R.L., 1989. Perspective. Science, 22 December 1989, p. 1543. Cited by Rabinow, P., 1996. Making PCR, The University of Chicago Press, Chicago, pp. 5–6. Return to text. Lindahl, T., 1993. Recovery of antediluvian DNA. Nature, 365:700. Return to text. Kahn, P. and Gibbons, A., 1997. DNA From an extinct human. Science, 277:176–177. Return to text. Ross, P.E., 1992. Eloquent remains. Scientific American, May 1992, p. 116. Return to text. Pääbo, S., Cooper, A., Poinar, H.N., Radovcic, J., Debenath, A., Caparros, M., Barroso-Ruiz, C., Bertranpetit, J., Nielsen-Marsh, C., Hedges, R.E.M. And Sykes, B., 1997. Neandertal genetics. Science, 277 (22 August 1997) 1021–1023. Return to text. Krings et al., Ref. 1, pp. 24–25. Return to text. Kahn and Gibbons, Ref. 36, p. 177. Return to text. Kunzig, R., 1998. Not our mom. Discover, January 1998, p. 33. Return to text. Wong, K., 1998. Ancestral Quandary. Scientific American, January 1998, p. 32. Return to text. Krings et al. Ref. 1, p. 27. Return to text. Personal communication. Emphasis mine. Return to text. Niklas, K.J., 1990. Turning over an old leaf. Nature, 344:587. Return to text. Gibbons, A., 1998. Calibrating the mitochondrial clock. Science, 279 (2 January 1998), p. 28. Return to text. Gibbons, Ref. 46, p. 29. Return to text. Mountain, J.L., Lin, A.A., Bowcock, A.M. and Cavalli-Sforza, L.L., 1993. Evolution of modern humans: evidence from nuclear DNA polymorphisms. The Origin of Modern Humans and the Impact of Chronometric Dating, M.J. Aitken, C.B. Stringer, and P.A. Mellars (eds), Princeton University Press, Princeton, p. 69. Return to text. Melnick, D. and Hoelzer, G., 1992. What in the study of primate evolution is mtDNA good for? American Journal of Physical Anthropology, Supplement 14, p. 122. Return to text. Marks, J., 1992. Chromosomal evolution in primates. The Cambridge Encyclopedia of Human Evolution, S. Jones, R. Martin, and D. Pilbeam (eds), Cambridge University Press, Cambridge, p. 302. Return to text. Personal communication. Return to text. Niklas, Ref. 45, p. 588. Return to text. Stringer, CB, 1993. The legacy of Homo Sapiens Scientific American, May 1993, p. 138. Return to text. Kennedy, K.A.R., 1992. Continuity of replacement: controversies in Homo Sapiens evolution. American Journal of Physical Anthropology, 89(2):271, 272. Return to text. Wu, X. and Poirier, F.E., 1995. Human Evolution in China, Oxford University Press, New York, p. 113. Return to text. Lubenow, M.L., 1992. Bones of Contention: A Creationist Assessment of the Human Fossils, Baker Book House, Grand Rapids, Michigan, pp. 131–133. Return to text. Kahn and Gibbons, Ref. 36, p. 178. Return to text. Marshall, E., 1997. Tapping Iceland’s DNA. Science, 278(5338):566. Return to text. Poinar, H.N., Höss, M., Bada, J.L. And Pääbo, S., 1996. Amino acid racemization and the preservation of ancient DNA. Science, 272 (10 May 1996) P. 864. Return to text. Rocky Mountain News, Denver, July 11, 1997. Return to text. Foley, R., 1995. Talking genes. Nature, 377 (12 October 1995) pp. 493–494. Return to text.